I have three USB power adapters between my wife's iPhone, my iPhone and my iPad, and one at work. The ones we have at home are in the bedroom so that we can both have our phones nearby, in case they ring, and because I often read late into the night with my iPad and want to charge it for the morning. Unfortunately I am often in the living room and need some quick power. 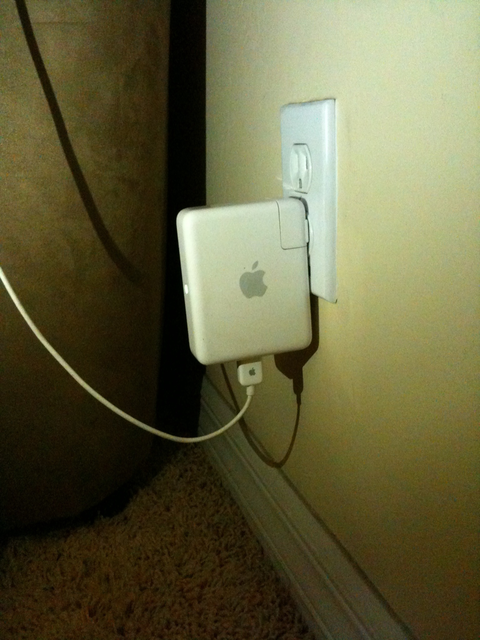 Fortunately, I recently set up an Airport Express connected to my wife's Bose SoundDock that is conveniently located next to my favorite chair. The Airport Express comes with a USB port that was intended for sharing USB printers or hard disks over the air. Since I have a network printer and a file server (along with three more Airports) in other rooms it goes unused here. Until I discovered that I can just plug in an extra 30-pin USB cable (I seem to have no shortage of thoseâ€¦) and now I don't have to cart around power adapters.